Beach evening primrose is a prostrate perennial with dense gray-green foliage. 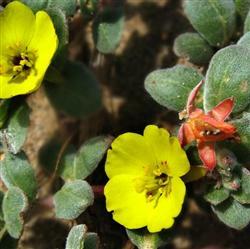 It forms a dense mat and produces bright yellow flowers that open in the daytime and close up at night, blooming from April to August.It is fast-growing and is ideally suited to dune gardens at the coast where it will tolerate the salt spray. You can use it in sunny borders, slope or container as long as you give it sandy or gravelly well-drainig soil. Beach Primrose is a common coastal strand plant, forming dense mats on beaches and in sand dunes along the entire coast of California. They can be found at Torrey Pines State Park.